Marshall McLuhan would often initiate discourse simply to see where the conversation would take him. His abiding interest was the perpetual advent and expanding potential of human communication—its twists and turns of phrase, rather than any point to be made (what one has to say) or any ideological resolution. He was fond of interjecting at his public lectures, “I’m putting you on” (“The Medium is the Message”), intentionally deploying the term in a playful misdirection, as Joyce might signify a specific turn of a colloquial Irish phrase with a transcendent epiphany, both as a fool’s game to get the language flowing. McLuhan’s fooling was akin to the court jester who creatively expresses a transgressive grievance to the accepted rule by making his statements transcendently equivocal and therefore universal. McLuhan’s wide-angled lens worked many angles. The residual relevancy of McLuhan’s work derives from his ability to look at the kaleidoscopic big picture without getting hamstrung by the delimiting perspective of the historically determined, private subject. His work predicted today’s de-subjectification of private identity in social media and the confounding logic of the private subject-as-object within the public network-as-verb of modern communicative media. McLuhan, ultimately, was never after any literal meaning but more a figurative vision of language as projected sense. He would rather play with language than have its force of naming constitute “the wretched mesh or sieve of our (private) attention” (The Gutenberg Galaxy 249), which tends to limit the phenomenal richness of mutable experience. In perpetuating my photographic project I consider incidental topographies in street furniture, infrastructural anomalies, walls, trees, roads, buildings, and people that occur in interstitial rambles through both urban and rural contexts. I take in partial instantiations of these worlds. The object of my photographic project, therefore, is never meant to be a classically-completed subject. My aim is rather to create an objective topology of subjective partition. The private, in this sense, is always already subsumed within the statement of an exteriorized field. McLuhan described how, “conferring the means of self-delineation to objects, of ‘statement without syntax,’ photography gave the impetus to a delineation of the inner world. Statement without syntax or verbalization was really statement by gesture, by mime, and by gestalt” (Understanding Media 181). Contemporary photographic gestalt has become the panoptic theater of exteriorized reason, a reason that paradoxically “fixes” the external in the darkroom development of the erstwhile private soul. If McLuhan has anything relevant say about this, it is probably found in his statement “The immense tidying-up of our inner lives (is maximized by)the new picture gestalt culture” (Understanding Media 177). In light of the ever-accelerating efficiency of our photographic tidying-up devices distributed in hyper-networked and increasingly fluid platforms such as Instagram, Snapchat, and Facebook, my intent at working toward the elucidation of a subjective “objecthood” in the virtual gestalt of the photographic realm might seem a fool’s wager, but then again that would most likely be a bet that Marshall McLuhan would have very familiarly “put” on. McGlynn, Tom. Bangor, Maine, Goodwill Furniture, 2013. McGlynn, Tom. Benches at Horseshoe (Canadian) Falls, 2015. McGlynn, Tom. Kalamazoo mailboxes, January 2016. McGlynn, Tom. Lower East Side grocery awning, NYC, 2015. McGlynn, Tom. Manila St. news boxes, Jersey City, 2015. McGlynn, Tom. metal pre-fab building, Judique, Nova Scotia, August 2013. McGlynn, Tom. Montreal (McGill) block and sign, 2015. McGlynn, Tom. New Jersey Turnpike weeds, 2016. McGlynn, Tom. NYC car with body spot, 2015. McGlynn, Tom. painted over crosswalk, Jersey City, 2016. McGlynn, Tom. sunset park Brooklyn painted stereo speaker, 2016. McGlynn, Tom. west side Manhattan silver van and dirty snow bank, 2014. McGlynn, Tom. 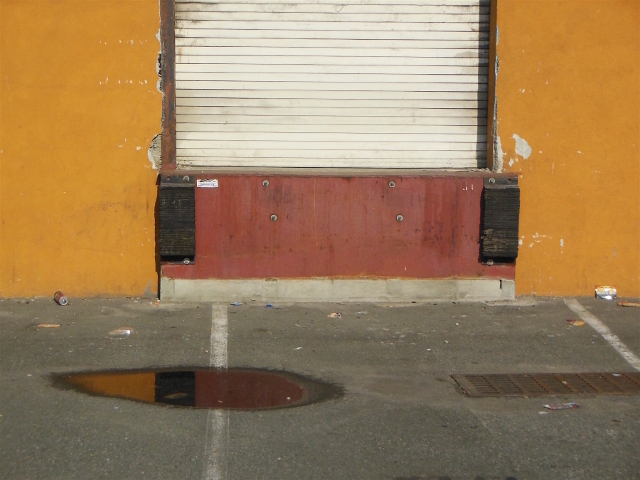 yellow loading dock, New Jersey, 2015. McLuhan, Marshall. The Gutenberg Galaxy. U of T Press, 1966. —. “The Medium is the Message.” Monday Conference, ABC TV, 1977. —. Understanding Media. McGraw Hill, 1964.